Seasonal affective disorder (SAD) is the worst, and it can creep up on anyone. There is one thing that may help fight your SAD, though, and that's watching motivational speeches. There are many ways to prevent SAD including altering lifestyle choices, therapy, or medication but if you're teetering on the edge of SAD, watching some inspiring speeches could help you from falling into the void. Last winter I believe I was affected by SAD. I'm usually a glass half full kind of gal, but I found myself feeling really low and unable to pick myself up, which I would normally be able to do with ease. According to the UK's National Health Service (NHS), "Seasonal affective disorder (SAD) is a type of depression that comes and goes in a seasonal pattern." According to the NHS, the symptoms of SAD may include, "a persistent low mood," and "a loss of pleasure or interest in normal everyday activities," among others. According to the Seasonal Affective Disorder Association, "SAD is a depressive illness caused by shortened daylight hours and a lack of sunlight." This definitely rang true for me — I was travelling to and from work in the dark, and I felt constantly exhausted and unenthused. Motivational speeches helped me to feel inspired and motivated again, so here's a selection for you to watch in order to fight back against an episode of SAD. Some people thought that the 2011 movie Sucker Punch was majorly sexist. Dodai Stewart, in her article for Jezebel wrote, "In the end, though the metaphor of mental institution as battleground is an interesting one to explore, that is not the analysis at the heart of this movie. Nope, Sucker Punch is a two-hour $82 million fetish film examining how hot sad schoolgirls look when holding weapons." I totally get this and I can understand why some people didn't enjoy it. As a feminist, I didn't like how the entire movie came across as what Stewart described as, "... not the fantasy of a young girl. It does, however, seem to be the fantasy of a man who likes to see young girls fight in skimpy outfits." Having said all this, my favorite parts of the movie are the insanely inspiring speeches heard at the beginning and the end of the movie, which never cease to help me pick myself up, dust myself off, and forge forward with a positive mental attitude. Emma Watson rose from the ashes of the Harry Potter movies, like Dumbledore's Pheonix Fawkes, to become a modern day feminist icon. She has become the eloquent and relatable poster girl for feminism, and I am so thankful that such a talented young woman can put her influence to good use and fight for the wonderful cause that is HeForShe. This short, yet powerful clip of her United Nations speech will hopefully make you feel like doing something positive to help other humans, because who's got time to feel SAD when they're changing the world? I discovered this speech when I needed it most. It was early this year, and I was feeling like my life was not going the way I had planned. I had finished university and came to the conclusion that unless I lived in London, I could not follow a career in the industry of fashion journalism, which I had spent years training in. I made some big life choices and realized that each time I tried to throw myself into a different industry, as much as I tried to make it work, my heart remained with writing. I was at a very low point, having attempted to succeed in another industry and feeling so battered down by life, while doing something I wasn't passionate about. I watched this moving speech and decided it was necessary for my sanity that I write for a living, and I made it happen. Sometimes in life you get beaten down but you must keep getting back up, because you never know what's around the corner. This speech by Kristen Stewart as Snow White, is one of my favorite movie speeches of all time. The references to light are particularly useful to those going through SAD. Snow White tells us that we are the ones who need to nurture our own light, however difficult it may seem. She tells a crowd, "... I know that light burns in all of you! Those embers must turn to flame." It's my favorite scene of Stewart's entire career as IMO, it's the most passion she's shown in an acting role. I totally wanted to be her "brother" after seeing this. As the old saying goes, out of the mouths of babes comes the truth. This has never been more relevant than in regards to Kid President's Pep Talk. Kid President is an old soul and he shares his words of positivity to encourage people: "The world needs you to stop being boring, yeah you! Boring is easy, everybody can be boring but you're gooder than that." I have watched this speech too many times to count and I always turn to it when I need to get myself out of a rut. I tell anyone who will listen about this speech, as it helps interrupt your pity party and fuels you to go out into the world and make a difference. Neil Gaiman is one of my favorite authors and I stumbled across his speech that he gave at a graduation ceremony for the University of the Arts in London. His motivational words on making "good art" can be applied to anything in life, even if you're not a creative. I personally applied this to my writing and realized I needed to start creating again. However, if you apply the mantra, "Make good art" to any area of your life that you're passionate about, you're sure to feel more fulfilled. You may have a side hobby that you enjoy which you have put on the back burner, or you may be struggling to find the time to do what you love. Gaiman's message is do what you do, and do it well. 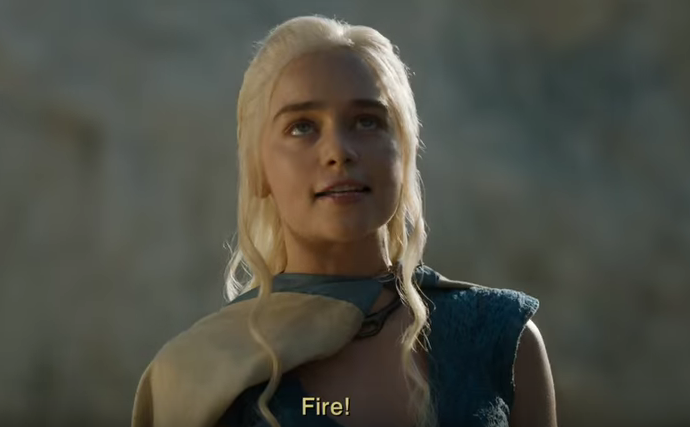 Remember Dany's dramatic speech to the people of Meereen? It definitely put fire in my belly like one of her dragons. I love this speech because not only does it stand as an inspiring metaphor not to be shackled by modern society, it also shows how far Daenerys has come on her journey. She was once a young woman who was abused by her brother and traded like an inanimate object, and here she is the Mother of Dragons and the leader of an army of people who choose to follow her. Inject some inspiration into your life with motivational speeches to help you power through the SAD season.